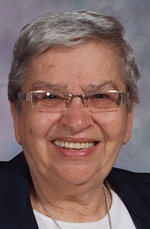 Sister Elsa Vazquez, O.S.F., 86, (formerly Sister Maria Angelica) died June 23 in Assisi House, Aston. She had been a professed member of the Sisters of St. Francis of Philadelphia for 61 years. Sister Elsa was born in Barranquitas, Puerto Rico, where she was a member of San Antonio Parish. She entered the congregation in 1953 and professed her first vows in 1955. She earned a B.A. in education from Neumann University. She ministered primarily in education and in parish ministry. Sister Elsa ministered for 36 years in her native Puerto Rico where she served in parish ministry, religious formation, adult education, ministry to people with AIDS and visiting people in prison. She worked at Convento de San Francisco in Barranquitas, Convento de Asis in Comerio, St. Joseph Parish in Rio Piedras, Immaculate Heart Parish in Caugas, San Fernando Parish in Toa Alto, Santa Clara Parish in Trujillo Alto, Casade Formacion in Loiza, and Nuestra Senora d la Salud Parish in Dorado. Sister Elsa ministered for 10 years in the Diocese of Allentown where she taught at Sacred Heart Academy. Additional ministry in education included teaching at St. Paul School in Wilmington, Delaware, and St. Joseph School in Lancaster. In each of these areas, she also spent time visiting with the local Hispanic families, helping them to adapt to living in a different culture. In 2008 Sister Elsa moved to the Archdiocese of Philadelphia where she lived at Our Lady of Angels Convent and volunteered at Assisi House, the congregation’s retirement residence in Aston. In 2012 she moved to Assisi House where she served in prayer ministry. The funeral Mass was celebrated June 27 at Assisi House and burial followed in Our Lady of Angels Cemetery in Aston. Sister Elsa is survived by her three brothers, Armondo, Angel Antonio, and Rafael Angel Vazquez; nieces and nephews, and by her Franciscan family.